Preheat oven to 350 degrees. Grease muffin tin generously with butter. Sauté veggies with 1 tablespoon of the butter, 2 Tbsp. olive oil and 2 ½ tsp. Bell’s seasoning over medium heat in medium skillet for 5 minutes or until veggies fork-tender. Set aside to cool down. In large bowl, add bread cubes and drizzle 1 cup of water over bread. Add 2 whisked eggs to bread and stir to blend in. Carefully add cooked vegetables over bread mixture. Using spoon mix vegetables and bread cubes until resembles stuffing consistency. Spoon mixture into 6-8 muffin tins to bake. 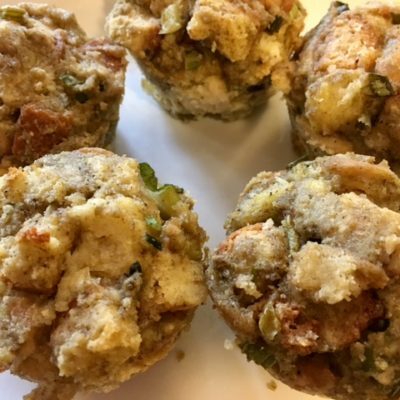 Melt about 1 tablespoon butter to drizzle evenly on top of stuffing balls (optional). Add a dash of salt and pepper to top of stuffing ball, if desired. A Registered Dietitian is a food and nutrition expert who translates the science of nutrition into practical solutions for healthy living. Make an appointment with ours today and see what a difference proper nutrition can make to your health. Click here to learn more about our Nutrition Services.